Cuisine: Gastronomic French with a modern American twist. Price: Very high (Eating at a three Michelin restaurant in New York has its price). Atmosphere: Classy, sophisticated and high-end. You better dress up for this occasion. Jacket and tie are required. 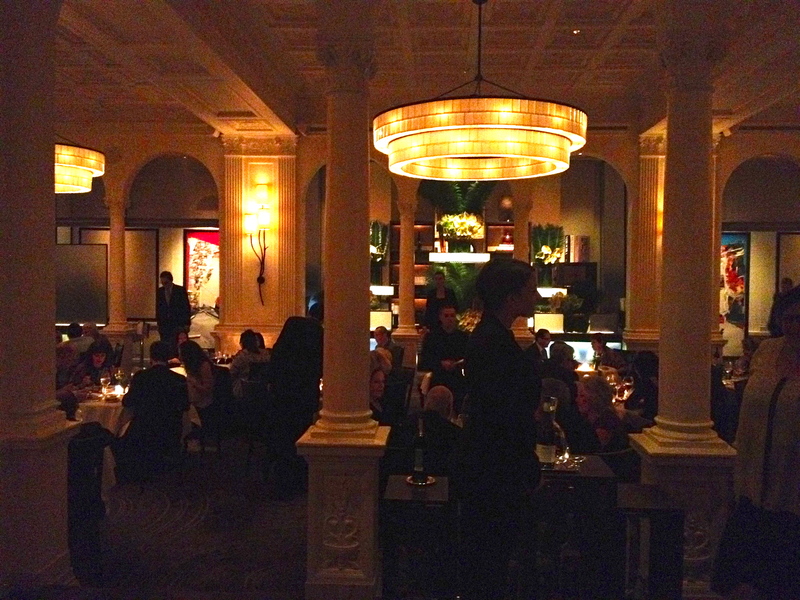 Daniel has been occupying the top dining spot place in New York for many years and its clientelle is top-notch. There are two areas to eat there. A more casual room right next to the bar and an elegant, expensive looking main dining room. We ate at the more relaxed bar area as it also felt a bit younger and is much easier to book than a table at the main dining room. The food is same though. Food: Playful, innovative and not too bold. I was quite surprised by the underplayed intensity of flavours in all dishes I ordered. The American palate usually craves something bolder, saltier, fattier and sometimes even creamier, but the chef Daniel Bolud took a slightly European approach in his recipes at his flagship restaurant Daniel. Starting with a seasonal dish of the QUARTET OF ECKERTON HILL FARM HEIRLOOM TOMATOES I expected to test the chef’s cooking art to see what he can do with one vegetable – the tomato. And a test it was. 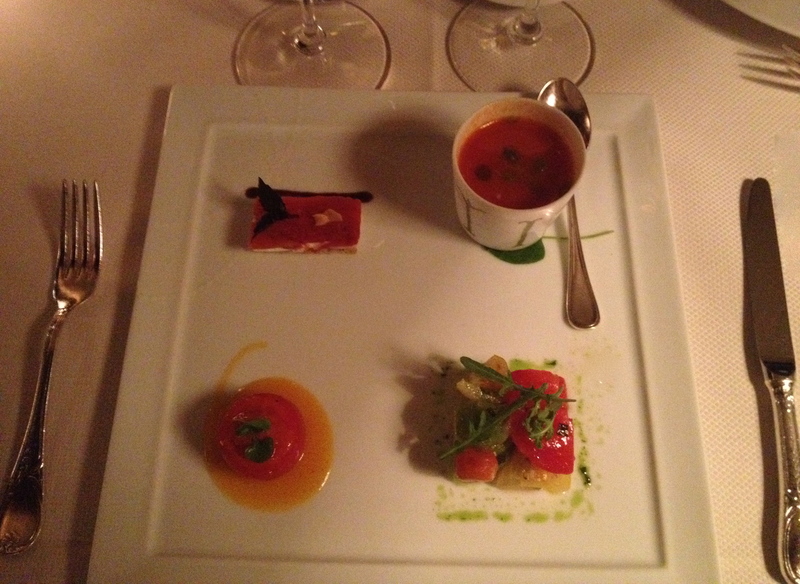 I was served a chilled tomato soup, an eggplant and tomato sorbet, yellow tomato coulis salad and a basil pistou confit with Brunet cheese. All creative and interesting, but not very tasty for my palate. For some reason I found the dish quite boring. My partner was more lucky as he started with MAINE PEEKYTOE CRAB SALAD served with pickled spicebush berries, celery shavings and walnut oil. The delicate crab meat was rolled in a thin slice of cucumber and drizzled with walnut oil which elegantly matched the crab and balanced its seafood rustic nature. The veggies added crisp and refreshing zing. In this dish the chef’s excellent balancing skill had sparkled. If I see it on the menu next time, I would not think twice and ordered this Crab Salad. 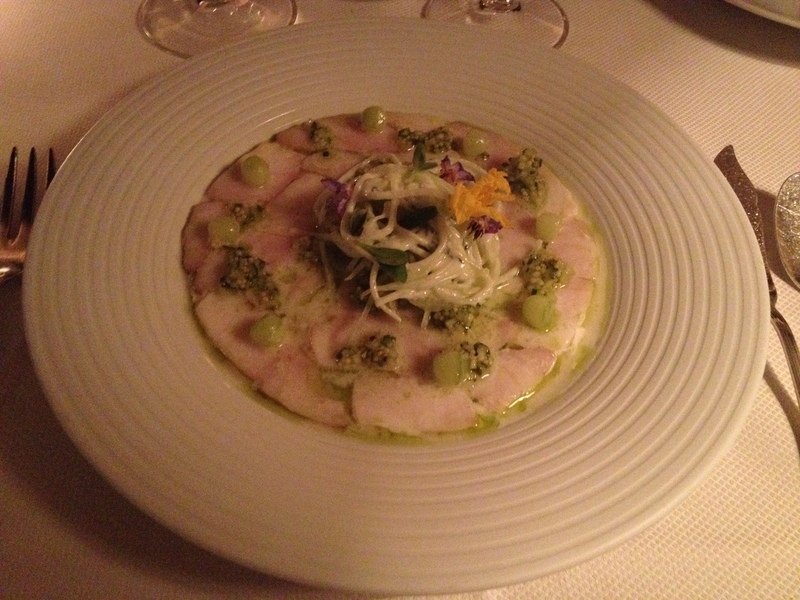 Moving to the main courses with SLOW BAKED THINLY SLICED STRIPED BASS topped with a cucumber daikon salad, lump fish caviar and wild spearmint-kaffir lime gremolata, I learned that my choice was unfortunate once again. The flavours of the partially cooked fish did not integrate well with the fresh cucumber daikon salad, although both were very good. the combination of ingredients in this dish just did not charm my palate at all. On the other hand, my partner’s DUO OF ELYSIAN FIELD LAMB CHOPS served with with roasted fennel and arugula salad was delicious. The confit ribs were glazed with fig balsamic and the lamb’s meaty nature worked very well with Tarbais bean purée. 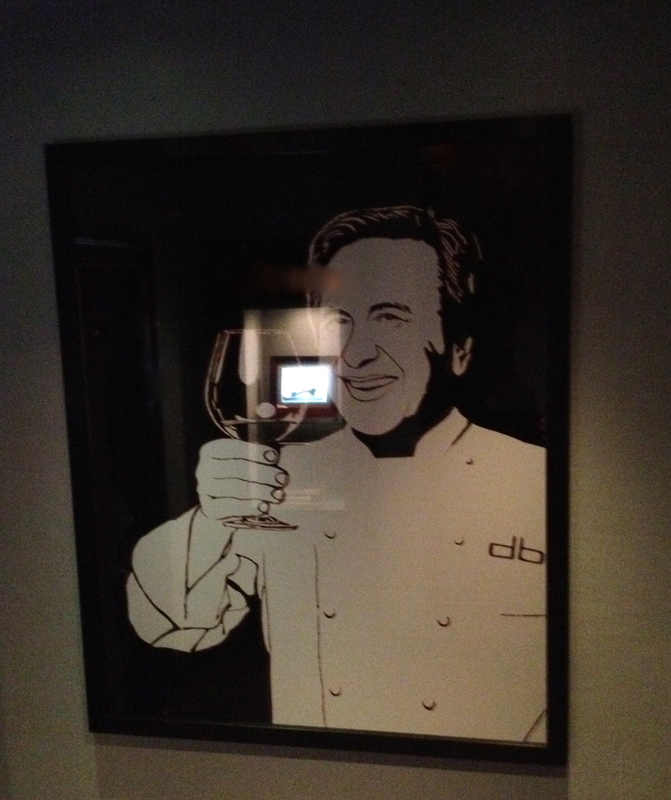 During this first and so far the last dining experience at the famous Daniel restaurant in New York I have learned that I need to know what the chef’s strengths are so I can choose wisely and enjoy the meal as I could have if I had ordered the right dishes. The cheese selection is quite interesting as most of the cheese is local or at least comes from the US. It was good, but not as the cheese at Gotham Bar and Grill I had just a night ago. Drinks: You can have a cocktail or a glass of wine at the bar before or after your dinner. It is a vibrant spot with an elegant atmosphere. The wine list at Daniel is outstanding. You will find treasures from the old as well as the new world vineyards. We went for a glass of Champagne and a bottle of red Burgundy – Chambolle Musigni 2007 1er Cru from Bertheau. The French Pinot Noir was a perfect compromise to match our dishes ranging from fish to meat. It was elegant and well-balanced so one could drink it also on its own. Opening hours: Dinner: Mon-Thu 5:30PM-11PM, Fri-Sat 5:30PM-11PM, closed on Sunday; Lunch only for private events.